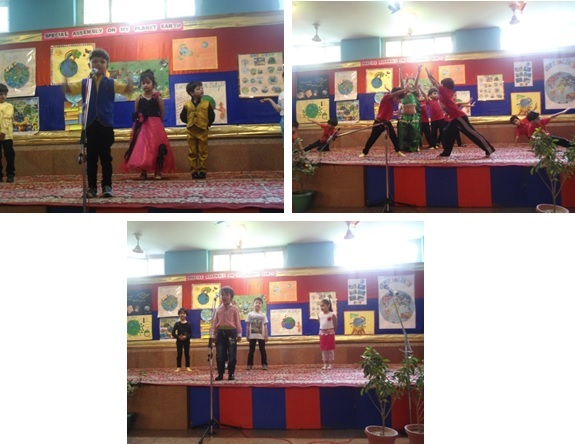 A special assembly was conducted by the classes I-A and I-D on the topic “My Planet Earth”. The assembly was a means to convey the message how to protect our planet/environment from various ill effects like land, air and water pollution. It was a small but a meaningful attempt to bring the children closer to our planet and also to bring forward to them, how we can keep the Earth safe and make it a better and a cleaner place. All the parents enjoyed the mesmerizing performances by the children. The dances and the song were the highlight of the event. All in all it was learning as well as entertaining experience for the participants as well as the parents.